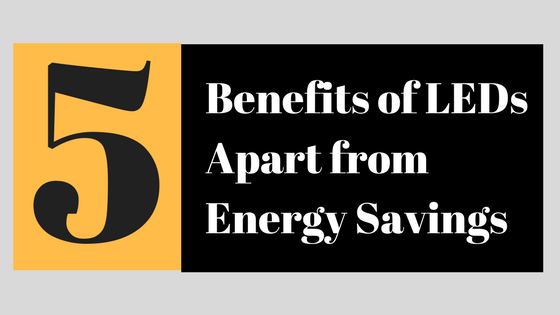 Here at Sitler’s LED Supplies, we constantly tout LED lighting benefits, one of the main benefits being energy savings. Yet, LEDs have so much more to offer in the way of benefits. Let’s dive into five reasons you should choose LEDs apart from their great energy savings! LED lights are great for many reasons, including their ability to turn the majority of their energy into light. While this saves on energy bills, it also means your LED light bulbs are emitting significantly less heat than traditional bulbs. This reduction in heat generated by LEDs means your air conditioners won’t have to work as hard in the summer, and they don’t generate any infrared light, which is also a source of radiated heat. If you currently have fluorescent tubes in your office or CFL in your home, you’re no stranger to the phenomenon which is dimming lights. Traditional bulbs tend to dim over time, becoming yellow or even orange. Traditional bulbs are also manufactured to emit light in all directions, including directions where it is not needed. LEDs are created to point light in a specific direction. LEDs are a directional light and, with their overall brightness, they can light a room better with less light in general than traditional bulbs. We’ve all been there; you’re up on a ladder, changing out a burnt bulb when you lose your grip and it crashes to the floor, shattering. Traditional bulbs are made out of fragile glass and must be handled with care. LEDs are manufactured to resist vibrations and impact damage. They can be dropped without breaking or cracking. LEDs are commonly referred to as full-spectrum lighting. The bright light they produce helps enhance our perception of our surroundings. And, as mentioned above, they give off no infrared lighting. What this means for store owners is your products won’t be subject to fading under LED lights. The lights show your products in their truest color, and they protect those colors from further fading and damage! You’ve seen the warnings on the boxes of fluorescent tubes; CONTAINS MERCURY! There is an entire protocol for what needs to be done if a fluorescent bulb is broken. LEDs contain no mercury and are overall more durable than fluorescent tubes. Upgrade your fixtures to LEDs! While LEDs are great for energy savings, they offer up so much more to consumers and business owners alike. Get started today with a free evaluation and assessment from a Sitler’s team member and discover the LED lighting benefits for yourself!